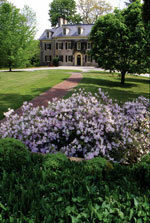 Hagley Museum and Library is where the du Pont story begins. Located along 235-acres along the banks of the Brandywine, Hagley is the site of the gunpowder works founded by E. I. du Pont in 1802. It provides a glimpse at early American industry and includes restored mills, a workers' community, and the ancestral home and gardens of the du Pont family. The museum grounds provide some of the most beautiful scenery in Brandywine valley no matter what the season. Make sure to budget some time just to soak in the views of the river. The museum offers free parking, lunch and snack facilities, picnic areas and transportation to three major interpretive areas. Jan. 17 to March 13: 10 a.m. - 4 p.m.
March 14 to Nov. 30: 10 a.m. - 5 p.m.
Dec. 1-31: 10 a.m. - 4 p.m.
Belin House Organic Café open daily from 11 a.m. to 3 p.m.
Museum Store: Open during museum hours, the shop offers books, gift items and historical reproductions of interest to all ages. Directions: Hagley is located on Del. Route 141, just north of Wilmington, DE, in the village of Henry Clay. From Wilmington, take Del. Route 52 (Pennsylvania Ave.) north to Del. Route 100 North, to Route 141 North. From U.S. Route 202 (Concord Pike), take Route 141 South. 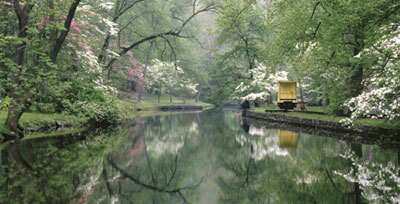 Hagley's picturesque grounds have been called "The Brandywine Valley's Most Beautiful Mile". Photo courtesy of Hagley Museum & Library. Exhibits and dioramas in the Visitor Center document the Brandywine Valley's early eras, look at the role of explosives in the nineteenth- and early twentieth-century life, and provide an interactive tour of the DuPont Company's history. The Powder Yard offers an in-depth look at the making of DuPont's original product, black powder. 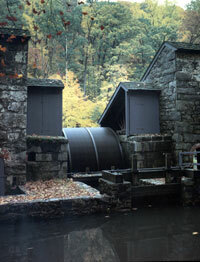 The Eagle Roll Mill provides a particularly dramatic demonstration as the energy of the river's falling water turns two eight-ton iron wheels to mix the ingredients of sulfur, saltpeter, and charcoal. At the base of Workers' Hill a restored machine shop of the 1880s offers an exciting picture of change in the workplace. The din of old metal-working tools in operation with whirring belts and grinding metal replaced the quiet, painstaking hand-tooling of the earlier artisans. Volunteer demonstrators explain the machines as they work. On Workers' Hill a typical workers' community has been restored. There, a visit through the Gibbons House reveals the lifestyle of a powder-yard forman's family-the foods they ate and the furniture and conveniences they acquired. Nearby is the school they attended, with lesson demonstrations that show how children were taught before there was a public school in the area. The Birkenhead Mill at Hagley Museum. Photo courtesy of Hagley Museum & Library. Hagley also focuses its attention on the lives of the mostly Irish families who lived and worked in the yards, with interpreters in period dress conducting tours and live demonstrations of domestic chores and activities in the actual homes of the powder yard foremen and their families. The Hagley grounds also include the charming Georgian-style mansion Eleutherian Mills, the first du Pont family home in America. Built by du Pont Company founder E.I. du Pont in 1803, the Georgian-style residence reflects the tastes of the five generations of du Ponts who lived there. Empire, Federal, and Victorian periods of furniture are highlighted in various room settings. Eleutherian Mills, the first du Pont family home in America. Located in front of the du Pont home, an authentically restored nineteenth-century garden, of French design, reflects E. I. du Pont's love of botany and gardening. Hagley's Belin House Restaurant is located on the museum's Workers' Hill. This restored community depicts the home lives of the DuPont Company mill workers and their families. Once home to several generations of company bookkeepers, today the Belin House provides a panoramic view for visitors to enjoy while dining. Visitors may enjoy selections from the menu daily from March 15 through November and on weekends in December. Their menu offers a wide selection of soups, salads, sandwiches, and specialties like the Hagley Burger (Boursin cheese and sauteed mushrooms). The Hagley Store carries a delightful selection of decorative items, reading materials, and gifts. Gift items include antique reproduction jewelry, china, glassware, site-related posters and prints, carbide cannons and transportation pieces, desk accessories, and stationery. Located in a historic building, once used for cotton and wool picking, the store offers a lovely shopping experience touched with the ambiance of nineteenth-century America.